Items found in your journeys can also be used to improve the earthquake-ravaged town's appearance over time. 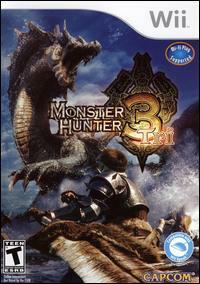 One of the key features in Monster Hunter Tri is the ability to join forces with up to three fellow hunters to battle the giant creatures. The Wii version features a split-screen option for two-player quests as well as online support for four-player quests. The game's online features will not include a monthly fee in the U.S. and European markets. Those who'd prefer to go hunting alone can enlist the aid of an AI partner for some of the more challenging quests. Three controller configurations are available, from the Wii Remote and Nunchuk combo to the standalone Classic Controller. The Wii Speak accessory is also supported for voice communication during online adventures.